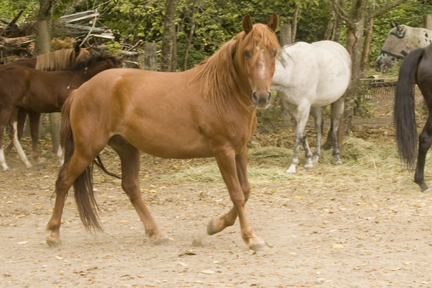 In late September of 2004 an imposing horse trailer pulled into the farm bearing a rescued pony. 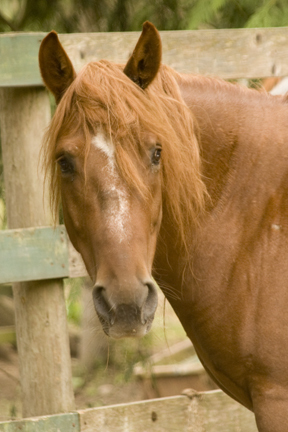 The driver for the horse transportation service said that in spite of his limited vision, LittleBig willingly loaded up the long ramp “like he belonged here.” He unloaded with an air of confidence that did not correlate to his appearance: a small, thin stallion with densely matted mane and tail and over 200 wounds to his body-many small, some larger gashes and everything in between. LittleBig had just made the journey from a Zillah, WA kill pen. It is a holding facility owned by a man who gathers horses and ponies from auctions and the public to sell for slaughter. LittleBig was purchased by the kill buyer at an auction. Up to a hundred anxious horses mill about this pen. Without enough room to get away or the vision to read other horses’ signals or see where to run, the little pony stallion was repeatedly kicked and bitten. When the kill buyer has enough animals to literally stuff a large trailer he has them hauled to Florence Packing in Stanwood, WA where equines are gathered prior to shipment for slaughter in Canada. Since LittleBig was small and in poor condition, he was sold for $50 – the amount, according to the kill buyer, it would cost to scrape him out of the trailer if he was trampled during the long haul. Shortly after LittleBig arrived here, we were contacted by a woman who recognized online photos of him. She realized that he was a colt she had rescued the previous year. She had observed him for months living with a similar colt. They had no shelter and no feed in the winter snow of eastern Washington. She located the owner who was so disinterested in the colts, he told her to just take them. Over the next few months she rehabilitated them and placed them in homes she thought she could trust. When she had been unable to locate LittleBig or his owner for a month, she found that he had been sold for a few dollars at auction. Our veterinarian, Dr. Hannah Mueller, assessed LittleBig soon after he joined us. She determined that his irises are white from either a genetic condition or malnutrition. We think that he can see something, such as movement or variations in light. He remains tentative with new people or situations. With time his physical wounds healed and he gained weight. When he was recovered from his ordeal, he was gelded. Fast forward to today, Little Big is strong and handsome. He is confident in his familiar surroundings and gallops exuberantly in the field. He interacts normally with the other horses giving wither rubs, playing and giving space to the boss. Every day we are grateful for the friendship of our little survivor. We are sure he will never again be hungry or unwanted.